Record heat and dry conditions continue to plague large parts of the United States this summer. While the south central region of the United States has been hit especially hard, more than 30 percent of the country is now experiencing drought, according to the National Drought Mitigation Center. Researchers have developed a tool called the Drought Monitor to compile and visualize the scope and impact of the heat. It is jointly produced by the National Drought Mitigation Center, the U.S. Department of Agriculture and the National Oceanic and Atmospheric Administration. The Drought Monitor measures data and field reports from over 300 experts onto a map that is updated weekly. 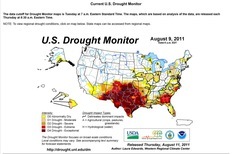 USDA meteorologist Brad Rippey is one of the authors of the Drought Monitor. He says the recent extreme heat aggravates drought conditions that began in the fall of 2010. The National Weather Service forecasts a 50 percent likelihood of another resurgence of La Nina, says Rippey, which would mean another year of extremely hot and dry conditions across the country. Hari Sreenivasan recently talked with Rippey about the impact of the extreme heat. Watch their conversation above. The NewsHour also recently made a high temperature widget, to track when heat records are broken. The widget is built to be embedded into any website, and the data behind it will be updated every day.